It’s the time of year for Christmas parties and other holiday gatherings. As such, it’s time to make “bring a dish to pass” dishes. 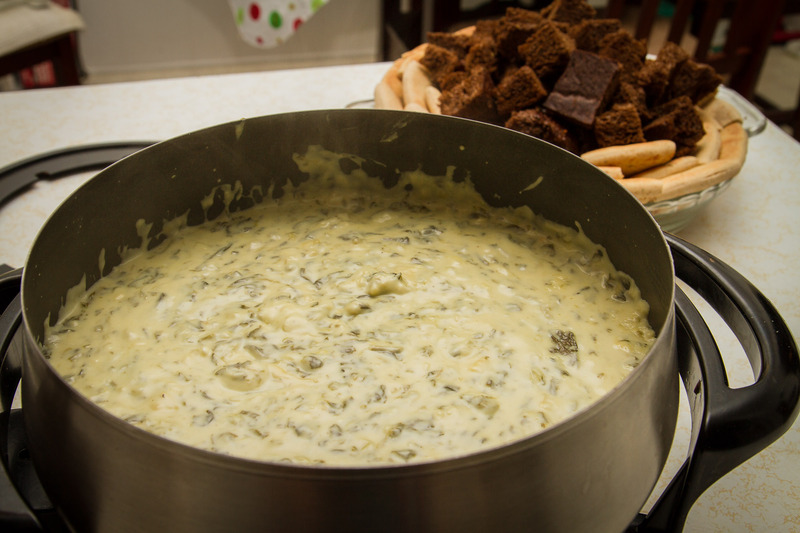 For tonight’s party: Spinach and Artichoke Fondue! Mix the cream cheese, buttermilk, and sour cream together in a mixing bowl until slightly chunky consistency. Add in 1/2 cup of shredded cheese (I used the Asiago for this step). Lightly flour and stir (helps the cheese blend with the broth). Set aside. In a medium-sized sauce pot, bring the chicken broth to just under a boil. Mix in garlic, green onions, spinach, and artichokes into the broth. Stir until just under a boil. Bring temperature to medium-high. Slowly add-in the cream cheese mixture, letting mix fully before adding more. Continue until you’ve used all of the mixture. Add in more cheese as needed to thicken the fondue. Once to desired consistency, transfer to a fondue pot to serve along with pita slices and bread cubes. This is one of the best spinach and artichoke recipes I’ve had; enjoy! This recipe derived from: Our Version of Melting Pot’s Spinach Artichoke Cheese Fondue @ Favorite Family Recipes.